In addition to being rich in chlorophyll (hence the bright green color), matcha is brimming with polyphenols, powerful antioxidants that help protect against cancer and cardiovascular disease, reduce blood pressure, slow the signs of aging, and much more. Like coffee, matcha contains caffeine - but most people remark on how matcha gives them a stable, very alert-but-calm caffeine buzz rather than the sometimes jittery and short-lived coffee buzz. Chock full of fiber and a great source of protein, calcium, iron, zinc, magnesium, and plant-based omega-3s, chia seeds are both very filling and very healthy. They're a great food for getting clear, glowing skin, for keeping your digestive system balanced, and for keeping your brain happy. 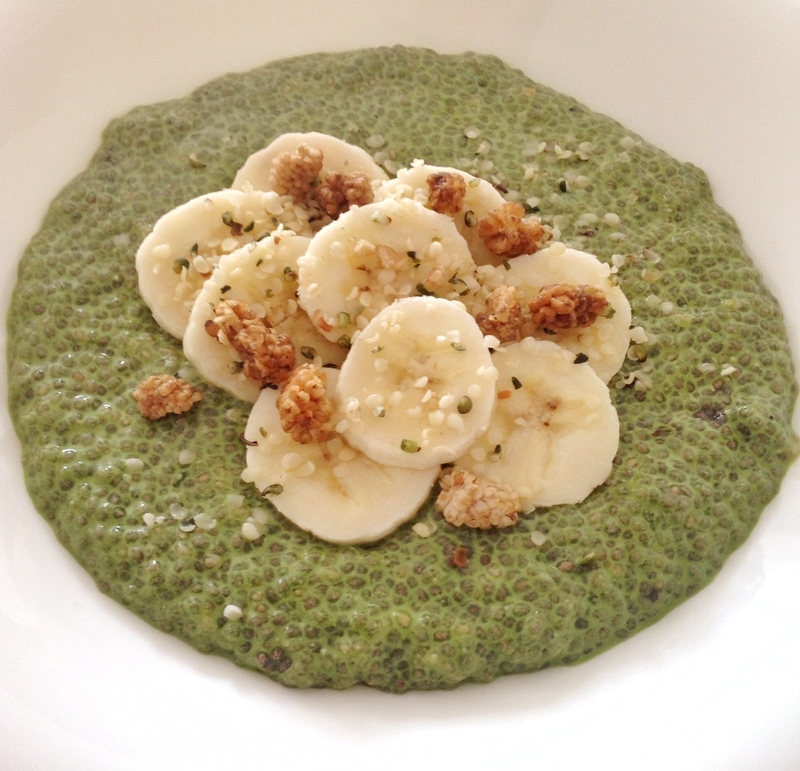 This matcha chia pudding makes an excellent breakfast. The matcha green tea makes it the perfect pick-me-up and gives you a long-lasting, steady energy boost that nixes the need for a morning coffee. We love topping this with sliced banana, berries, and/or hemp seeds, but you can get creative! Feel free to mix the ingredients together the night before, stick them in the fridge, and then wake up to a lovely chia pudding in a convenient on-the-go container. 1. In a blender, mix the almond milk, matcha, maple syrup, vanilla extract, and salt in a blender. 3. Wait a few minutes and then stir thoroughly again. 4. Cover and place in the refrigerator for at least 20 minutes. 5. Whenever you're ready to eat, take it out of the fridge, sprinkle on whatever toppings you're using, and enjoy!